I think I've finally found my HG nail polish remover, and that's a DIY solution of pure acetone mixed with water and glycerin, a la loodie loodie loodie style. The key to the removal is what has taken me a long time to learn, and that's not with foil or with cotton pads and swabs. It's a scrubby tub. I use to scoff at the scrubby tub, but after using it for a month, I don't think I could ever go back to anything else. It removes glitters and polishes in seconds, and leaves no annoying lint behind. It can be more drying than using a swab or pad, but the glycerin helps keep the fingers moisturized during the removal. The only downfall is that I think I've loosened the brushes too much and I'm in need of a new tub! Today's mani started with one of my favorite yellows, American Apparel Manila, aptly named after the shade of a manila envelope. It glides on easily, just be careful to not overload the brush because the formula is a bit on the watery side. There's no streaking at all and it coats fully after two rounds. 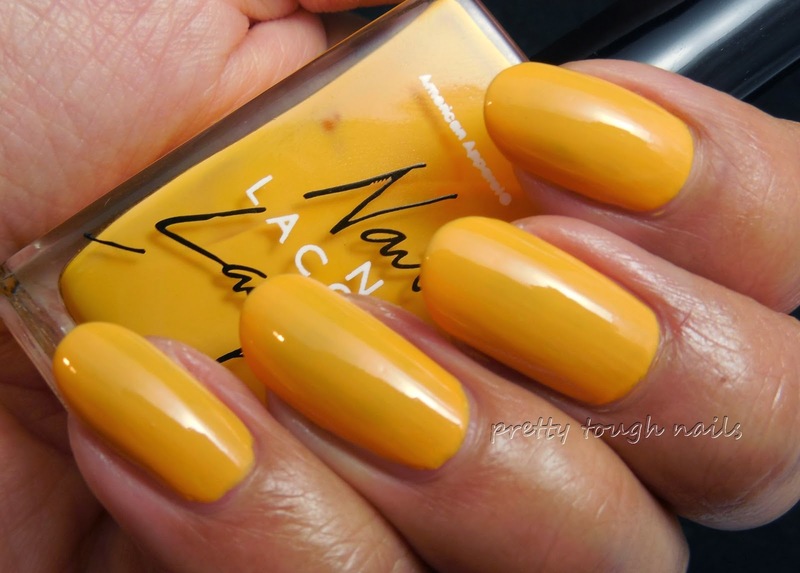 I didn't use a topcoat in these pics Behold the awesomeness of an amazing yellow cream! 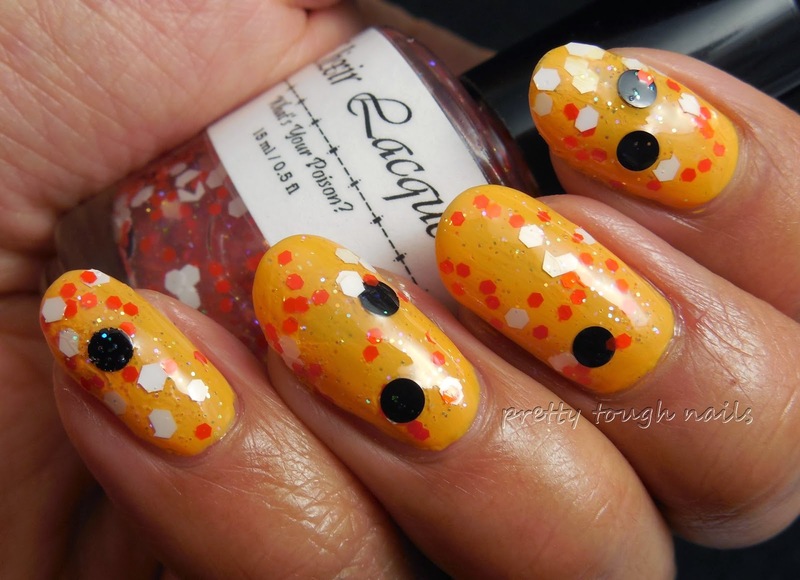 I've been wanting to use Elixir Lacquer Snowman Suite ever since I first saw it in the TPF swap box as a koi inspired mani. Layered over Manila, I think it creates that effect fairly well, and looks like orange, white, and black spots over golden yellow scales. I used two layers of Snowman Suite here, and had some difficulty manipulating the polish because it was thick and sparse in glitters. Most of the glitters had sunken to the bottom already and I had to fish out some of them to get the glitters to cover the nails evenly. This is finished with a layer of topcoat. I really like the iridescent mini glitters in Snowman Suite, here it looks like bubbles of water while looking down at the koi. 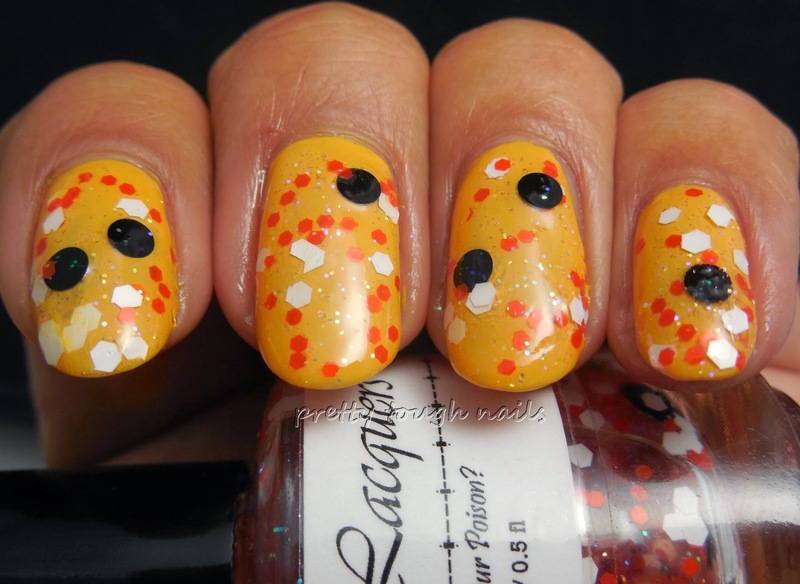 I'm sure the intent was to mimic snow, and overall, I love the matte white, orange, and black glitter combination as a glitter topcoat. If I was patient enough for it to dry down all the way, and had the right plates, I would stamp some koi fish in black. Alternately, it looks like strikingly similar to a yellow taxi cab. 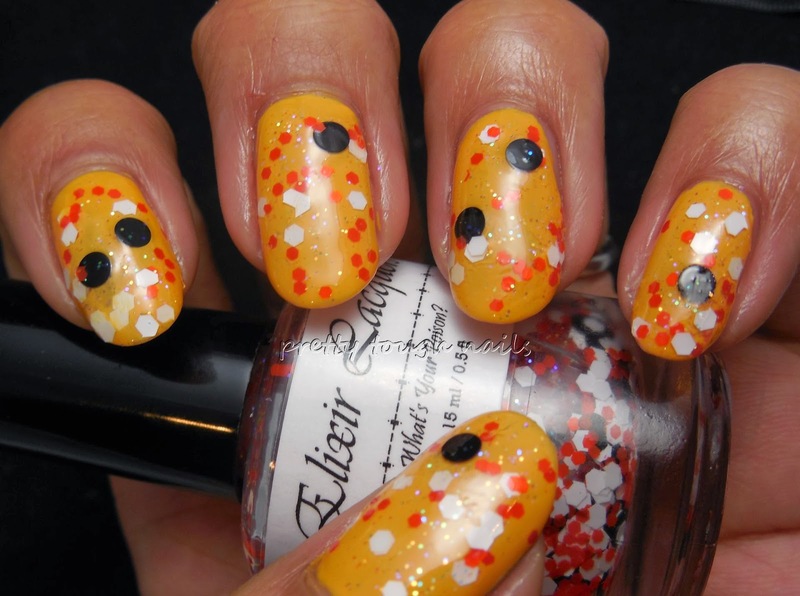 What do you do when glitter topcoats are thick and lacking in glitters to cover properly? It's really frustrating when glitters are hard to use but if I have any that have some sinking glitters, I just turn them upside down for a bit before actually painting my nails. It usually does the trick! Also, I've heard some great things about Nail Pattern Boldness Glitter Food. Oh and some thinner from Sally's could help with the thickness! I have it and it's pretty good. Still, even with the problems you experienced, this polish is pretty cute. 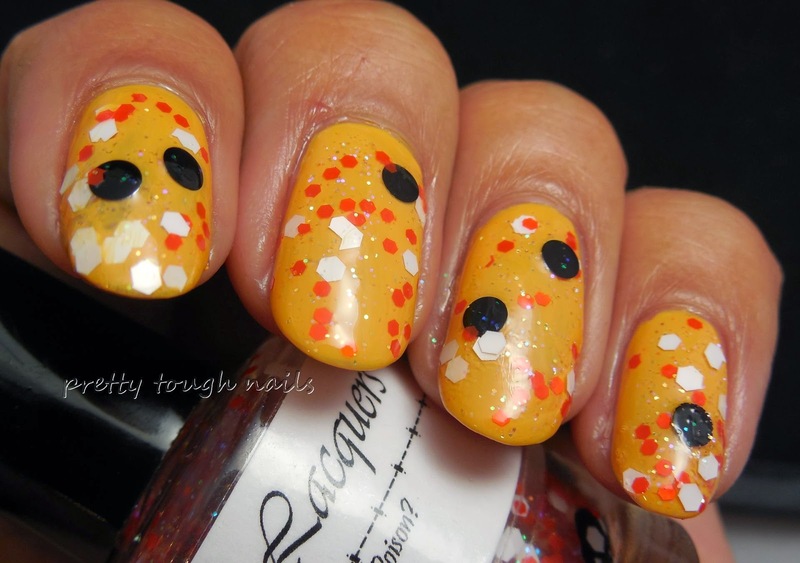 It could work as a Halloween mani. It kind of reminds me of candy corn. I have two polishes from this brand and I'm curious to try them now. I hope they aren't too troublesome. I love this manicure, Thithi! 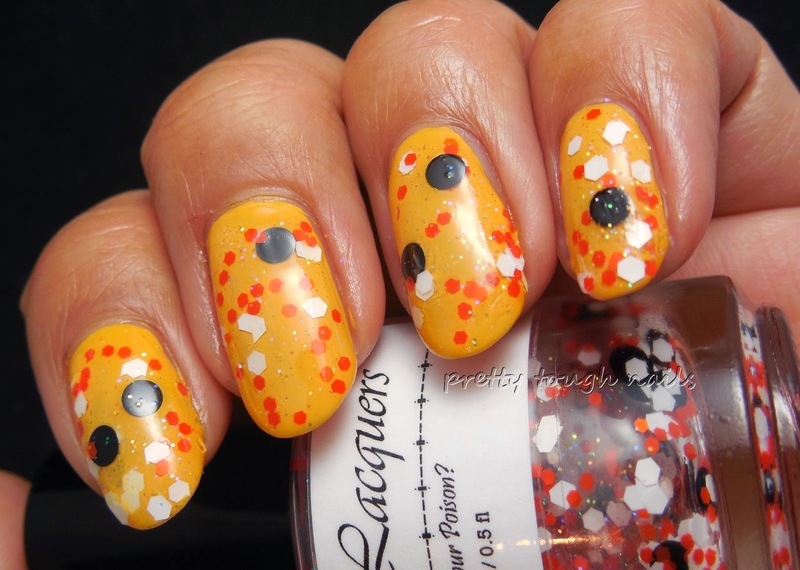 It's full of lively speckledy goodness and that yellow looks FANTASTIC on you!